... and turn your soundcard on and have fun with this little drum-sequencer-demo! Just after three weeks of study, I could write this little multi-media-App. It is not that I pretend to be that mega-coder - it is in that great language itself! the most important parts of the sourcecode of this program will be explained below. not ready - combine a listbox with a sub-listbox? not ready - setup a trackbar and evaluate it ? not ready - combine a trackbar with an input-field for the value? not ready - allow only number-input in a text-box? not ready - show controls or not - depending context? use a timer (to do every 10 miliseconds something)? divide string (a big one to a substring-array)? not ready - draw something (e.g. line)? not ready - refresh draw by each form-refresh? not ready - establish graphic-buttons - evaluate click on graphic-region? not ready - evaluate click on white and black piano-keys? not ready - show a walking fingerprint on the piano-keyboard ? not ready - write and read a textfile? not ready - write and read a XML-file? Inlineframe - compatible since IE3, NS6, OP5. I could also say : 1 for run, 2 for stop and 3 for rewind, and call playmid(midireplay.lastmidnam,3) and then evaluate it in the function playmid: if (mimo==3) ...; - but it makes it a little bit more handy. You don't need to remember, what "3" means, you just can use it as you speak "Midmod.rewind" - isn't it better? Why working with functions at all? To avoid that midimode-parameter you do all the things that the function midireplay would do here and now and immediately. Then you would have no function and no parmeter to transfer. But this you has to do for middireplay.stop and also for midireplay.run - so this is the purpose of working with functions. 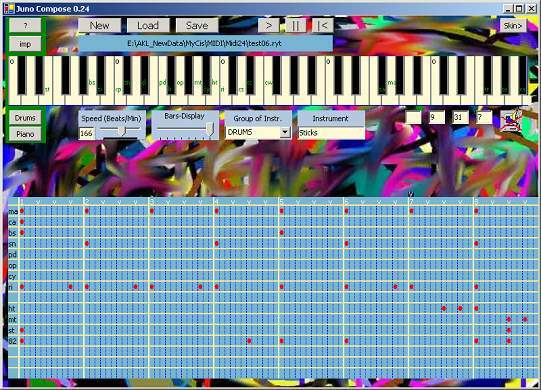 In function midirerplay you make something same for each kind of midimode. This you had to repeat if you wouldn't build a function midireplay.